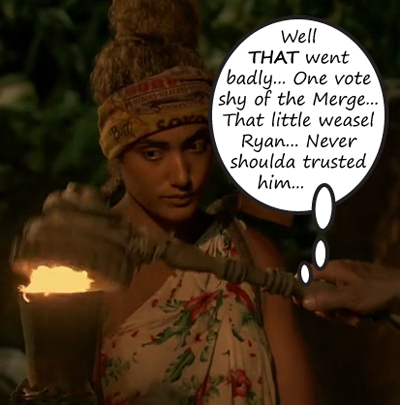 This time on Survivor… When Soko returns to camp, Ali immediately lays into Ryan about his vote wanting to know why he didn’t tell her, why didn’t he trust her like she trusted him, etc. Ryan explains that he didn’t trust Roark, Ali was too close to Roark, and that’s why he voted the way he did and why he didn’t tell her. Ali says she only knew Roark for four days, Ryan says that’s all it takes sometimes and points out that they only knew each other for six days. Ryan explains to us that Ali’s outburst was not a good look and that her torch might have to be the next one snuffed. At Yawa, Dr. Mike has caught a fish! He’s super proud of himself, even though it’s just one small fish, he’s providing for his tribe and he feels great… Until, while cooking the fish, half of it drops into the fire. 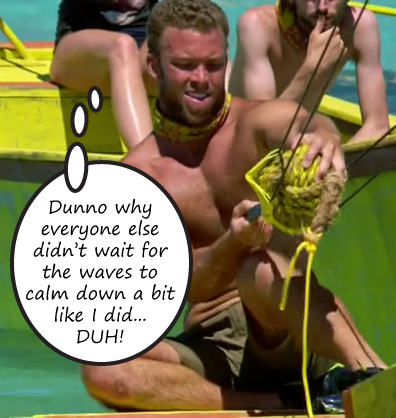 While the rest of the tribe laughs, Mike actually does retrieve the fish. Ben says that he was determined and although he’s out of his element, Mike is performing very well and he does a much better job of sharing than Cole. Cole has caught several fish – and hasn’t shared them with the rest of the group. To Ben, Cole and Mike have shown who he can’t and can work with; Cole is showing his true colors and they aren’t pretty. Later, Cole asks if they should cook up some rice, but they don’t have much, no one else is really hungry at the moment and Lauren says they can’t just feed him. Cole isn’t happy, he tells us that needs bigger portions or he won’t be able to perform. After Cole and Jessica leave the shelter for the beach, Ben, Lauren and Mike discuss Cole’s behavior and selfishness. They also know that Jessica is smart and probably wouldn’t go “live in the van” with him. Lauren is very happy that Mike is seeing the negative side of Cole because it’s just the crack she needs within the Healers to help her and Ben stay in the game. Come on in, guys! It’s time for Reward! Up for grabs? First place: 10 pizzas and ice-cold soda. Second place: one pizza. In this challenge, two tribe members will race through an obstacle to retrieve two poles that they will use to carry a buoy over tilting balance beams over to wooden chute. Once the ball has been dropped into the chute, it will release a lock on a boat that they must pull to a platform in the ocean. At the platform, they must use a ball on a rope to knock down two targets. Survivors ready? GO! JP and Ali are first to drop their ball down the chute; Ben and Cole, and Desi and Ashley drop their balls on the first go and have to go back and try again. Once the other members of Soko have ran the course, they have to work on untying the boat, while they are working at the knots, Ben and Cole drop Yawa’s ball in the chute and Desi and Ashley drop their ball again. Just as Soko finishes untying their boat, or so they think, Yawa begins working on their knots. It’s neck-and-neck between Yawa and Soko. FINALLY, Ashley and Desi drop their ball in the chute and they race to catch up with the other tribes. Ben and JP are already shooting at the targets, but soon, Joe takes up the slingshot for Levu. Shooting at these targets is NOT easy because big swells of ocean waves keep rocking the launching platforms. JP is first to hit a target for Soko, Ben hits one for Yawa, and Devon has taken over for Joe, but after one failed launch, Joe takes his place. In a very smart move, JP has been waiting for the swells to pass before taking another shot and when he finds a window of calm waters, he hits the final target for Soko winning them the first-place prize. Joe takes another shot, but it doesn’t matter because Ben smacks the last target for Yawa before he can reload; Yawa wins second-place. At Soko, everyone is eating a whole pizza for themselves and spirits are high. As JP explains his perfect first date, Ryan laments to us that JP is a beast of a competitor with no social game. 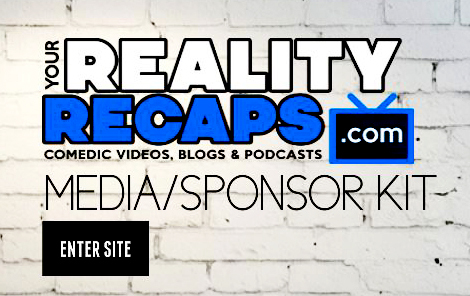 This close to the Merge, physical threats like JP are just that – threats. Ryan thinks that maybe it would be smart to get rid of JP now, if they are forced to go to Tribal, so they don’t have to deal with him later. 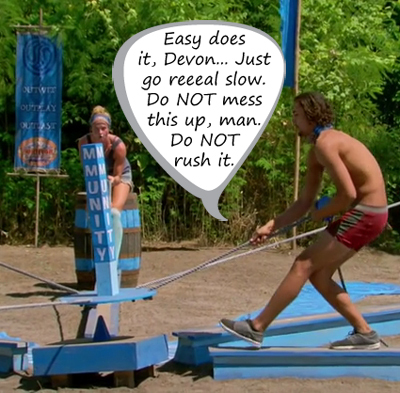 At Levu, Lauren and Devon are determined to talk to Desi to convince her to flip on Joe if they have to go to Tribal and Devon is concerned about Joe finding another Idol. Joe has a better record for finding Idols than he does. Later, Lauren gets a chance to talk to Desi alone while Joe and Devon are out looking for coconuts and gathering up crabs to cook. Lauren says Joe is the most strategic player they’ve see so far in the game, and Desi recognizes the threat. When Lauren asks if Desi would consider voting Joe out, she says she would definitely consider it because she knows Joe will only keep her around for as long as he needs to for his own game. While Joe is out with Devon gathering food, he tells us that he’s always looking for Idol clues and he knows that Devon is watching him closely. When Joe actually finds a clue to the location of the Idol, it’s hidden four feet away from the well, he is careful to not raise any suspicions and vows to destroy the clue and find the Idol that night. And, big surprise, Joe is able to sneak away from camp in the middle of the night and digs up the Idol and this time, no one is going to know about it and he also vows to find another one if he can get to the well at the other camp. HA! No, you won’t, Joe! Dr. Mike has it! At Yawa, Cole collapses, but Dr. Mike and Jessica snap into doctor/nurse mode and get his feet propped up in a tree. Jessica insists on cooking her portion of rice for him, he needs to eat because this is a food issue. Cole fainting really scared her, it scared everyone, but it made her realize she cares about him more than she thought and she’s not ready to play this game without him. Dr. Mike reveals to us that Cole is a liability now and that he might have to be the next to go if they have to have a date with Jeff. When Ben returns to camp, he wasn’t there for Cole’s episode, Mike light-heartedly tells him the news. Later, Ben and Mike have a conversation. Ben thinks Cole is a liability now too. They can’t keep babying him. 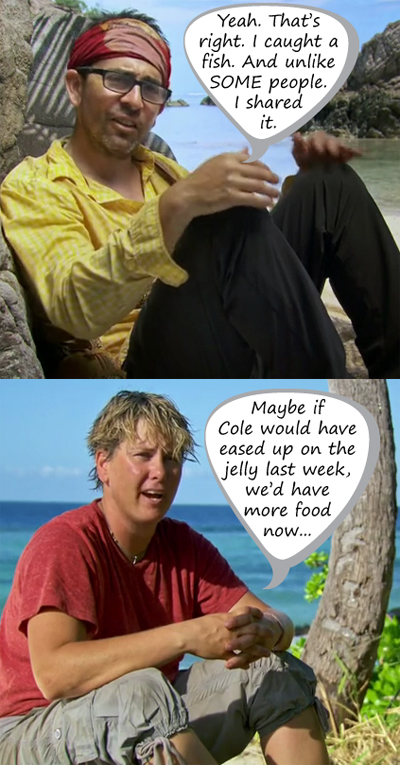 Cole knew he was going on Survivor and should have packed on a few pounds instead of working on his six-pack. Ben says that Cole has sealed his fate and if they lose the next Immunity, Jessica’s boyfriend will be the next to walk down the path that will take him out of the game. 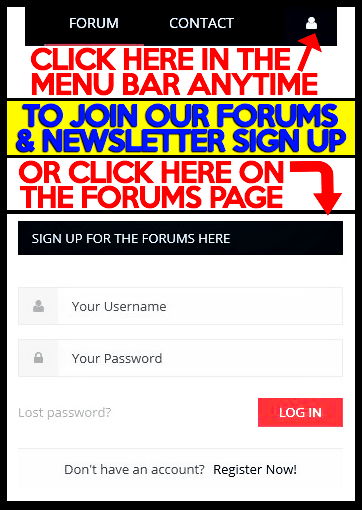 Come on in, guys! It’s time for Immunity. In this challenge, four people from each tribe will have to remain standing on a beam while balancing a wooden disk with ropes. On the disk, they will have to stack blocks to spell IMMUNITY starting with the Y building upwards, but to do so, they must transport the blocks from one side of the balance beam to the disk in the middle. If anyone falls or the stack collapses, they must start again. Survivor ready? GO! All the tribes are progressing at about the same pace, but as Ryan places the first “I” for Soko, the stack topples and they have to start again. Levu and Yawa are still keeping a good pace, but Levu’s stack topples, then Soko’s stack falls again leaving Yawa with a HUGE lead over the other tribes. Cole places the last block for Yawa, but as he’s inching his way backwards across the beam, their stack falls. Levu has taken the lead, but Soko isn’t far behind as Yawa races to catch up to the others and they are moving fast with a new strategy. And just like that, everyone has placed their last blocks, but Yawa’s new strategy lands them in first place with JP and Devon fighting to get back to the starting point on the beam, but *SNAP* Soko’s blocks fall again and with one foot in the right place, Levu takes second place sending Soko to Tribal Council. Back at camp, the mood of Soko is grim. Ali is the obvious target for JP, and Ryan agrees with him, buuut, Ryan is very nervous about bringing JP to the Merge. In order for Ryan to orchestrate JP’s demise, though, he needs to make amends with Ali so while they are alone together, he apologizes saying he was terrified of Roark. Ali knows things are not looking good for her and when Ryan brings up the idea of sending JP home, she is quick to get on board. They will need Chrissy to align with them, though, and Ali volunteers to talk to her about making this move against JP. Ali gets her chance later and lets Chrissy know that even though she voted for her last time, she wants to prove that she can be just as loyal to Chrissy as she was to Ryan. Ali also mentions how strong JP is and that she’s worried about taking him to the Merge. Chrissy nods her head and all that, but she never really says anything to Ali to confirm that she’s down with a JP blindside. Chrissy isn’t sure what she should do, but she definitely trusts Ryan the most and who goes home tonight will be decided by the two of them. Ryan also isn’t sure what to do, but everyone seems to trust him and he’s not sure why because he’s a weasel – his words. And awaaay we go to Tribal Council! Jeff asks Ryan what happened back at camp after the blindside; Ryan tells the story then Ali confirms that they’ve made amends. Jeff asks Chrissy what the current mood is within the tribe and she tells him that they all suspect a Merge is coming soon and all four of them want to make it, but that’s not going to happen. Ali pipes in to say that moving into a Merge you need numbers and you need to be able to trust people. Jeff tosses the idea into the discussion that JP must be getting nervous because it’s around this time in the game that the big contenders quickly become targets. JP knows this and he is nervous, but at the end of the day people are going to do what’s best for them. Jeff then brings up that JP says things without saying anything, Ali agrees, she never knows what JP is thinking. Chrissy agrees, JP plays a quiet game, Ryan agrees as well, but he knows JP isn’t missing much and could become a super player. Jeff congratulates JP on continuing his stone-cold stance and JP says it was a good wake up call for him to learn how people are thinking about his game. As the wind picks up, Ali says she’s really nervous because of what happened at the last Tribal, but talks the same talk as JP – people are going to vote how they are going to vote. Chrissy basically says the same thing and that there are good reasons to keep and get rid of everyone in their small group. And it’s time to vote! No one plays an Idol so Jeff reads the votes: Ali, JP, Ali, aaand… Ali… WHA??? I’m shocked!